So what about that future? Not surprisingly, like most of the industry, CMC Markets has stated that 2013 is rebounding for them. In terms of their Next Generation platform, according to the broker, the system is delivering “improved profit margins and operational cost efficiencies”. What is interesting about the platform is the firm’s focus on mobile. Written about earlier in year, when CMC Markets deployed an update to its proprietary Next Generation trading platform, it was called the broker’s “biggest ever” upgrade. 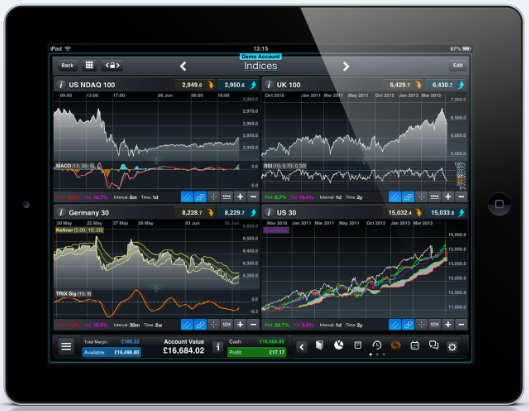 The major features were a focus on mobile trading with chart and screen size optimization for iPads, pattern recognition software, integrated client sentiment tools and social media integration. During a smaller upgrade in July, CMC implemented an overall mobile friendly change that made the platform more adaptive to smaller screen sizes. At that time, Forex Magnates pointed out the firm’s focus on its enhancing its proprietary platform, in contrast to launching MetaTrader 4 like several of its rivals. Sounds like the way to go to me. I don’t do automated trading so have never used MT4, but the discretionary trading I do is mostly initiated from my iPhone. Here in the Japanese market a lot of brokers are constantly upgrading their mobile offerings. No doubt brokers must love traders who use MT4 for the volume it generates though.